Celebrate someone very special to you with this exquisite array of orchids in a silvery keepsake vase that will always be a reminder of your thoughtfulness. A unique gift that is both subtle - and sensational! 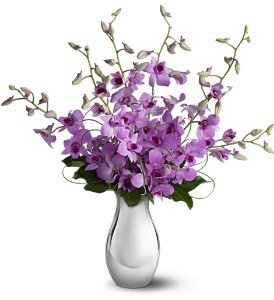 The elegant bouquet includes six lavender dendrobium orchids delivered in a classic silvery ceramic vase. Bouquet is approximately 21” W X 22” H. This item is hand-arranged and delivered by Designs East Florist.